Thanks to several sponsors, and my partner in this adventure, I am trail-class riding the Iron Dog Snowmobile Race this season. This is the preparations page; see the Race Story for pictures and diary of the actual race event. Basically, the race goes Anchorage - Nome - Fairbanks. The pro class is eligible for prizes, while the trail class conveniently ends in Nome (no Fairbanks leg). Specifically, the race is over the Northern Iditarod Trail Route. Start is in Big Lake, Wasilla, about half hour north of Anchorage, and goes through Skwentna, Hellsgate (near Rainy Pass), McGrath, Ruby, Unalakleet and Nome. My machine is a SkiDoo MXZ Renegade X 800, race modified and equipped for the Iron Dog. The rules require a measure of emergency and survival equipment, tools and spare parts. For instance, I have removed the long "racing style" seat, and put in a short seat; changed out the tail light assembly and plastic rail, installing a trailer oval light and tubing rail. This gives me a 27 inch long deck behind the seat for gear and supplies. My partner, Ken Shappiro has a Fan Cooled MXZ 550F short track machine. Younger and more agile, Ken and the lighter machine make a nimble combination befitting his driving style. Which machine is better is the cause of endless debates. I really do not see the argument; mine is clearly superior. All my previous experience has been on Polaris Indies. Thus the SkiDoo was a real eye opener. Stability and control is much improved. The dynamics enhance handling; turning the handlebars causes the machine to track the skis precisely, something the Indys don't do well. The motion over the bumps is simply incredible. My arse is right on the pivot point, so the area under me is essentially motionless. After 200 miles of riding over severe tundra and bumps, there was not even the slightest hint or indication of small-of-the-back or kidney aches. Initial pains across the shoulders and arms were taken care off by handlebar adjustment. Thigh pain was taken care of by riding a couple times. At the downtown Tesoro we topped, and off at sunrise, 11:30 AM. Cross town, and followed the eastbound road, dogging poles and guy wires, which is always exciting. Kenny was the better driver, and ranged ahead, then waited for me. At the edge of the city limits, we departed the roadside and went on the snow trail, well marked by tripods and stakes. Not much snow; the tundra tussoks were showing, perhaps 50% coverage of loose snow. After Hastings Creek, 9 miles east of Nome, we took the trail behind Cape Nome. The higher elevation and north-facing slope had much more snow, and our speed picked up to 40 or 50 mph. Still, had to be careful of ditches and other perils as they are not yet smoothed over by snow. As the sun rose higher, we rounded the back of the Cape and made a beeline for Safety Roadhouse and the Safety Bridge. It was good going, with speeds in the 50 mph range across the lagoon. On the other side of the bridge it was absolutely awful. We found no trail, large rocks, gravel, sand and the most horrible bumps and drifts. Later on the return we found an alternate route, but on the way out we suffered through a few miles of this purgatory, and did not even do 10 mph. Conditions improved halfway to Solomon, and we were able to speed up. Solomon, and the Bonanza Channel bridge, is where the trail and the road part company. The trail supposedly follows the beach to Topkok; alas, the last storm surge had not only leveled most of the trail markers, but had deposited driftwood, rocks and sundry debris on both sides of any remaining markers. Again, our speed faltered, so we took to the lagoon as far as the Topkok shelter cabin. What a difference a bit of elevation makes! Here we had some real snow, not just ice and ocassional patches, but the real McCoy. Yes, Sheila, there were some bumps and even a couple hair raisers, but for the most part we let the machines have their legs. Kenny again was the faster driver and would race ahead 15 or 20 mph faster than Old Man Ramon, and then wait for me. We found the trail to be very well marked with lath and tripods, and met three crews from White Mountain that were busy repairing markers, aligning things a bit and marking hazards. My friends Dean Pushruk and Eric Morris were among those hard at work. This is in stark contrast to the Nome trail crews that seem to bicker eternally and do late work on the trails. Most years I work as a Ham Radio Checkpoint at "Timber", on the Klockerblock River for the Nome Golovin snowmachine race. A beutiful place, it has some tricky woopsies for the unwary, so we threaded carefully through the trees. This is the treeline coming from Nome: west of here there are no trees. A few miles later we hit the Fish River with White Mountain only 5 miles ahead. The river is flat like a pancake with the ocassional bump for the unwary, but we were able to open up the rigs and clocked over 80 mph. At 2:00 PM we zoomed into White Mountain, where most people thought that 2.5 hours from Nome was pretty decent time given the trail conditions. Gas stop. Round numbers: 71 miles. Kenny 6.8 gallons, Ramon 6.1 gallons. The gas pit is the White Mountain Native Store, and has the most ultramodern fully electronic gas pump, and the price was 3.39 per gallon, a full 36 cents cheaper than Nome. The people say "less taxes and less local government rules and b.s., that's why!" To which I say "Amen, brother!" Now a couple hours of visiting, flirting, rest, relaxation and innumerable cups of coffee....enough coffee in fact to put my brain into my favorite "Altered State." Finally, at 4:20 pm with goodby to our gracious hosts, Tom & BJ Gray, and Eddie and Tiny Titus, as well as Nora, Patrick, and Amy, we are on the way back to Nome. The sun is dipping on the horizon; hollows on the trail are shadowing purple, and the headlamps are picking up details. As the trail gets darker, and the miles roll on, Ramon reaches a certain threshold of awareness that enhances his performance. This is one of my assets; one that I can ignore discomfort and tiredness and simply roll mile after mile. Kenny this time fell to second place. He could (and did from time to time) barge past me, but for the most part I could tell he was simply dragging arse and did not feel like being the leader of the pack. Well, good enough. Also, he wears glasses and I suspect, but did not ask, that my night vision is better. I simply was comfortable on the way back, and was much less apprehensive of trail conditions. Our return route differed in detail. Identical as far as Topkok, we pretty much stayed on the lagoons and inlets to well inside Safety. This was a much more relaxing route. Not being marked, and the wind making for blowing snow with visibilities down to 50 feet in places, I simply steered by the stars and avoided obstacles. Although the ride was relaxed it still took more time. Somehow we missed the turn to follow the trail behind Cape Nome. By going around the front side we encountered lots of bare gravel; simply terrible on the machines. My poor carbides are not going to make the Iron Dog, but may last a few more practice runs. At Tesoro Gas Station: Again 71 miles, Kenny 6.2 gallons, Ramon 6.1 gallons. Notice the relaxed yet more steady travel made Kenny's 550 Fan use less gas than before, whereas my 800 was loafing at either rate. Travel time: 3:30. This run was not on the Iron Dog trail, but went northwest to the Snake River. Riders were Zaaq, Kenny, Daisy and myself. 35 miles, all uneventful except for some excitement when Daisy went through the ice into the Snake. However, it was only a foot deep, so no harm done. Again, not on the Iron Dog trail. West along the beach to abeam Sledge Island where the conditions got simply awful. There was no snow, just some scattered ice on the beach. The land was all rock, and the offshore ice was covered in blown beach sand. Only Kenny and I on this trip; our machines overheated, so we cut inland towards the Sinuk River. The higher elevations gave us just enough snow between the tussocks to allow the coolers to do their job. Kenny was driving his 600 SkiDoo, not the 550 Fan. Once we got to the Sinuk River, the snow was better and we had a good time instead of an ordeal. However, on the way back to Nome I had an oopsie by the Cripple river, impaling the machine as shown on the picture at the top of this page. To begin with, I have to tell you this 800 cc rig has an animal of an engine. Just touch the throttle and it takes off like the Space Shuttle. By dint of practice, I have gotten to where I can tame it, and creep along at 10 mph. But one rough spot remained. Right at 32 mph, the machine would surge and jump to 40 mph. It was virtually impossible to go between 30 and 40 mph, which is actually the principal cruising speed that I want on strange trails. The machine had a TEAM secondary clutch, so out it came where I discovered that it was running on the 54-44-46 helix. I rotated the helix to the 46 fixed angle, and put back on. Tested it today. The hump at 32 is gone, and I can choose any speed from zero creep to 50 or more. There is a bit of a surge at 18, but it is actually possible to do 15, or 20, and the transition over that spot is no big deal. Nothing like the 32 mph one from before. We took off a bit late; Ken, Daisy and I. Over Newton hill to Dexter, across the Nome River, and followed the old Buster Road trail to New Eldorado. On New Eldorado creek we got on the ATV trail, and followed for a few miles. Of course, this is a summer trail, and now has feet of snow on it. As it winds through brambles and willows, with uneven snow and drifts -and lots of powder- it is a real excercise. Standup driving, throwing the body from side to side, and in one case just losing it and diving into a willow patch. Instant stuck. Kenny comes over: "Oh Ramon, look what you did! You are stuck. You got to do this....and that....yadda...yadda!" But anyway, Kenny is the big brute on this team, and in short order the machine was out of the hole and pointing the right way, so off I went. Kenny shouts "Watch me!" and there he goes. Right into the same spot, and tips over into the willows: "%&^($)()@&^ !" Oh well. Daisy hung back and watched the whole episode, and when it was her turn, she just went right thru with no hint of trouble.... until we lost the trail. Here we are turning around in a clearing; kinda sloping actually, and around I went, around Kenny went....and Daisy...oopsie Daisy, she tipped over and stuck. "$^*^@)%^ !" But some grunt work and we are all heading back to Nome. Temperatures were -5 or so, and a very strong wind came up on the way back and visibility was 25 feet, but since we know the trail, we got home safely. Preparations never stop. We have had to do several things to these SkiDoo machines; after all, they are mostly built to go on short, groomed trails in the lower 48. Rear racks. 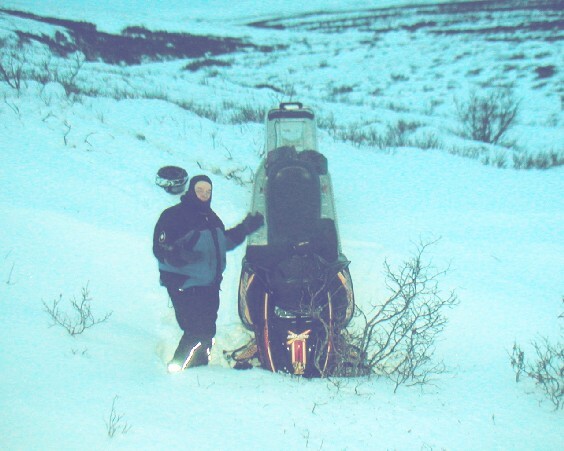 Unless you want to look like a "Gypsy Wagon", you have to do something about the rear deck area on a SkiDoo. Both rigs had the standard, long seats. From eBay I got a short seat that ends where the gas tank ends. SkiDoo has a plastic fairing with a silly "glove box" for this area, but it is useless and off it came. We also removed the plastic rail and tail light assembly, which eats up space. In my case I bent a length of half-inch electrical conduit (aluminum tubing would have been better, but it ranks with Unobtanium here in Nome). I built some stanchions to hold it about an inch above the aluminum rear deck. This gives me a 27" long by 16" wide cargo deck. My tail light is an oval trailer unit, sealed beam 1157, and is mounted to the grab handle in back, part of the tow hitch. Ken's machine is short-track, but he got an aluminum rack from an old Arctic Cat. We cut this in half and extended all the rails and tubes with half- and three quarter- inch conduit. The new rack is now the length of his rear deck, about 18 inches long. The same type of oval trailer light is built into the rear of the rack. Looks kinda nice, wish we had painted it black and you could not tell from a factory job. We have added all sorts of little knicknacks here and there to hold tools, oil jugs, cookware, etc. Ken has a possibles bag on the handlebar, and the most beautiful cookie tin that was a perfect fit alongside the chaincase. In my case I put a thermos and a length of 4" stovepipe alongside the chaincase to hold more tools. My folding cable come-along, with a 100 foot rope does the work of ten men when stuck in a hole or in overflow. It will actually lift the machine clear off the ground. It tucks neatly under the front hood. Determined to enjoy hot Cheeseburgers at the Hell Gate and the middle of the burn, I am still working out the details of a food warmer. After all, one cannot leave behind his cultural roots and fast food Americana just because he is in the middle of Alaska in -30 below weather. I have done this in the past: in Mosquito Pass north of Nome last year. In that case, picture a rest stop with 5000 ft mountains all around. Eight guys and machines. Out comes frozen bread, frozen links, frozen nuts, cold Little Smokies, various frozen or soggy candybars, bags of trail mix, lukewarm coffee etc. And Ramon... well, he opens the hood and pulls this baggie out, opens it and the STEAM comes out, and this delicious aroma of molten Cheese, cooked onions, and warm ketchup. The jaws dropped on those guys, and I did not share one little bite with them, although I was sure to weave a walk among them so they would partake of the redolent and delicious smell of a good, old, American Cheeseburger. Gotta have that. The local amateur radio club, SPARC, has sponsored our radios, throat microphones and other gear that we are going to experiment with on the trail for machine to machine communications. Ken is KL1YJ and I am AL7X for those interested. We expect to use 146.52 on the trail, and the local Nome repeater on 146.94. The cold weather is worrisome and scary. The latest forecast for the coming week, Feb 1-8, is for interior temperatures of -50, and none of us has any experience with these extremes. I have Synthetic Oil in my sled, and Ken is doing the same. Other than hot coffee and maybe a bit heavier clothing, what is a guy to do? What if the sled breaks? Driving the sled is a lot of excercise, and a guy generates heat and stays warm; but on foot it may be a different story. I am really thinking of bringing my tarp and a tent in ADDITION to the bivy bags we both have. Any ideas out there? We are team 41, see you all at the "Show and Tell" on Saturday Feb 11. Total Miles: 0 But a lot of running around! My machine is ready. Just a miriad details. Things like racks to hold the fuel jugs; packing the waterproof bag and figuring out some sane way of strapping it on; thermos holder and trinkets like that. I put a temperature gauge on the motor. This way if things start heating up, I can get a heads up on the trend. Arctic Whitney (a local metal fabricating shop) sponsored me a BV2S helmet, the latest technology in helmets. Darth Vader is green with envy on this one. It fits in every way, and is warm; no vents or any obvious way for air to come in. Way it works, the breathing mask look just like a Paramedic oxygen mask. It makes a total seal between the elements and my face. The nose and mouth are inside the mask. One way valves on the mask allow air from inside the helmet to be breathed in; and exhaled air is directed outside via a tube and one way valve. A knob on the front of the helmet adjusts the pressure against the face ensuring a seal. There has been some negative press on this helmet, but I think it is from people that blab before they study the situation. This is a sophisticated helmet; and it will NOT work if you have a beard or whiskers that lay under the mask. The seal must be perfect, and there are varius coarse and fine adjustments. Once it is set up, it dons in a few seconds. Although the helmet is warm, it still needs a Balaclava to keep the neck area covered. I use a Klim Wind Stopper, which is ultra thin breathable at the top, and windproof from the chin on down. I've had it for 3 years now, and swear by it. No insulation whatsover on it, but it does an amazing job and is perfectly compatible with the BV2S because it can be pulled down under the chin. I took it for a ride in -15 and was instantly sold on the BV2S No fogging, and the flip down sun shield is perfect. I think this is the helmet I am going to use on this race, because my KBC TK8S helmet is second best to this one. Post-race comment on the BV2S: The mask latches like to ice up, making it awkward to take the helmet off. You would want the helmet off to work on things. Lastly, the field of view is narrow. SkiDoo claims wide field of view, and technically correct, but the nosepiece blocks the view between the eyes and the wide field of view only exists for one eye at a time. With both eyes at work, the field is narrow. Today, Monday, I drove to Nome and put the machine on Everts. Kenny did too. Loaded to go, Kenny's tipped the scale at 572 pounds and mine at 621 lbs. We still have a few items to go on, maybe 15 pounds each of us. With my long track the snow pressure should be the same, but let me tell you that lifting the back end of mine is daunting. At 4:30 pm Everts Air Cargo took off for Anchorage with both machines. A bit of emotion along with it: I went to the airport to see the machines being loaded and the plane take off. Such a graceful airplane, the DC-6 with the props and throbbing engines. It is a bit of nostalgia for an old, retired bush pilot like me. Copyright © 2005-2006 Ramon Gandia. All rights reserved.